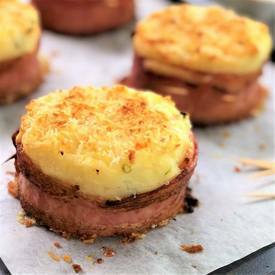 Baked mashed potato cakes w/ bacon! Crunchy bread crumbs – check! Looks like four of my favorite foods combined into one mouthful – how about you? Thought so! And sooooo simple to whip up – all you are doing is making mashed potato, wrapping it in Bacon, sprinkling the top & baking. Done.